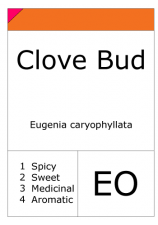 Clove tree is a member of the Myrtaceae plant family. This pyramidal shaped tree is indigenous to Indonesia and Molucca Islands in the Southern Philippines. The high oil producing destinations are Indonesia and Madagascar. 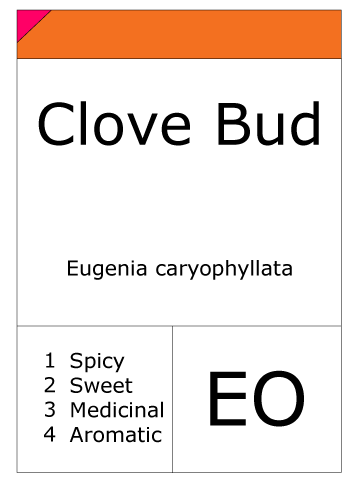 Clove is a slender that is generally grown in tropical climates. This fragile tree grows up to a maximum height of 45 feet. The fragrant buds contain about 20 % essential oil. Eugenol (ca. 80 %), eugenyl acetate and caryophyllene are the major constituents. 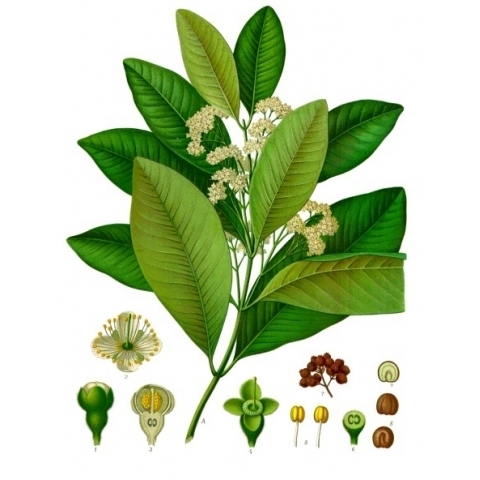 Eugenol is also present in the leaves, from where it is isolated by steam distillation and used as a starting material for the synthesis of several important compounds. Moreover, it is used in perfumery because of its powerful and characteristic, 'spicy' clove odour. All members of the myrtle family contain essential oils, see also allspice and bay leaf.